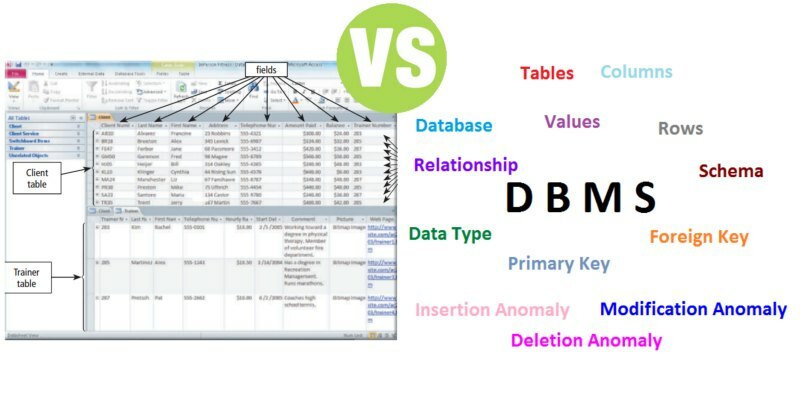 Summary: Difference Between Database and DBMS is that database is a collection of data organized in a manner that allows access, retrieval, and use of that data. Data is a collection of unprocessed items, which can include text, numbers, images, audio, and video. is a collection of data organized in a manner that allows access, retrieval, and use of that data. Data is a collection of unprocessed items, which can include text, numbers, images, audio, and video. While with database software, often called a database management system (DBMS), users create a computerized database; add, modify, and delete data in the database; sort and retrieve data from the database; and create forms and reports from the data in the database. A database is a collection of data organized in a manner that allows access, retrieval, and use of that data. Data is a collection of unprocessed items, which can include text, numbers, images, audio, and video. Information is processed data; that is, it is organized, meaningful, and useful. Computers process data in a database into information. A database at a school, for example, contains data about students, e.g., student data, class data, etc. A computer at the school processes new student data and then sends advising appointment and ID card information to the printers. Databases have many advantages as well as some disadvantages. A database can be more complex than a file processing system. People with special training usually develop larger databases and their associated applications. Databases also require more memory, storage, and processing power than file processing systems. Data in a database can be more vulnerable than data in file processing systems. A database can store a lot of data in a single file. Many users and programs share and depend on this data. If the database is not operating properly or is damaged or destroyed, users may not be able to perform their jobs. Furthermore, unauthorized users potentially could gain access to a single database file that contains personal and confidential data. To protect their valuable database resource, individuals and companies should establish and follow security procedures. Despite these limitations, many business and home users work with databases because of their tremendous advantages.